Big does not means the best. 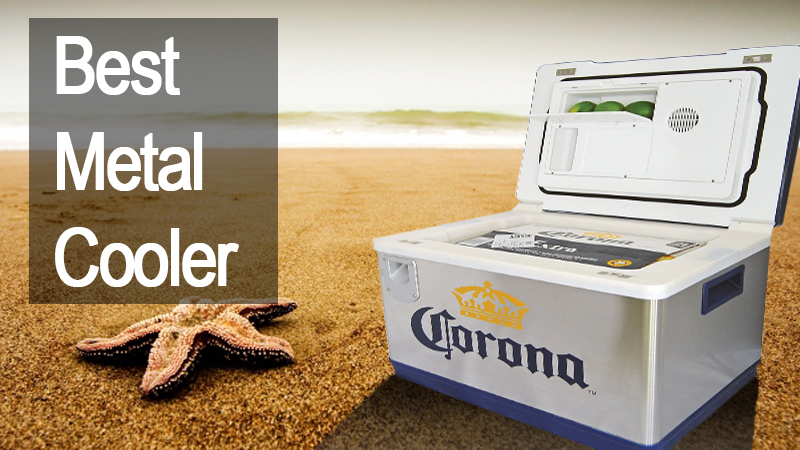 Best Small Coolers for You. Best Marine Cooler To make Your Fishing Unforgettable. New coolers generation. Best soft coolers for amazing trips. We got used to coolers which sizes are rather big. And it is clear why – when you are going to a long trip the bigger will be cooler the more different food and drinks you can put in it. But not always need such large coolers, there is a lot of different situation when you need small, convenient and portable cooler. Such coolers can be relevant at your office instead of a habitual lunchbox or you can take them to short road trip. 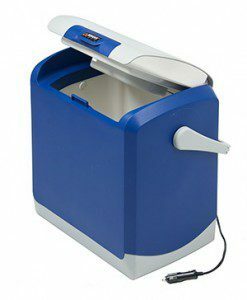 To save you from wasting your time by choosing the best small cooler among hundreds models online we have prepared this article. We hope that here you will find the best small cooler that will satisfy all your needs. We offer you to take a close look at the list of best small coolers and familiarize with their characteristics. Best Variants Among Small Coolers. Let’s Compare! Best variants of Small Coolers for You. Each of Them Is Ready To be Bought! It is almost impossible to choose among hundreds of different variant but short list of variants is bad too. We have picked up the list of the best representatives of small coolers in order to give you a choice but at the same time not to overload you with many models. Let’s start! This small cooler will definitely become a favorite for everyone. Due to its small square size this cooler will not take much space wherever you put it. Despite its small dimensions Igloo Ice Cube Cooler’s spaciousness is equal to 14 can that is a very good index for such tiny cooler. Specially designed construction together with convenient handle and strong rough feet make this cooler very portable and stable on every surface. Basing on many reviews from users all over the world we can make a conclusion that durability and convenience of Igloo Ice Cube Cooler make it one of the best small coolers at the world market. Some people write that they use this cooler as a lunch box at work and affirm that it is much better. For additional information you can go to the next link and read more about best lunch coolers here. 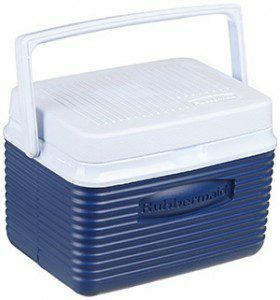 The next quality representative of small coolers is Rubbermaid Small Ice Chest. This cooler’s spaciousness is five quarts and it means that you can easily put up to six packs of your favorite drinks. Rubbermaid Small Ice Chest cooler is available in two bright colors, you can purchase it in red or blue color. The body of this cooler is resistant to smells and spots and can be easily washed in the case when you spill some drinks. Rubbermaid Small Ice Chest is convenient for carrying in hand because its light weight and durable handle. This “lunch box” is the best combination of usefulness and minimalism. You will not find any extra detail in its construction and this is its main distinctive feature. After reading many reviews about this model we have found out that most users like Rubbermaid Small Ice Chest for its size. They affirm that its dimensions are a “golden mean” because it is neither too small nor too big. Also many of users write that this cooler is incredibly easily washed. This cooler is available to purchasing in two different colors and sizes. You can order it in size of sixteen or seven quarts as good as choose the one you like more among dark blue or green colors. 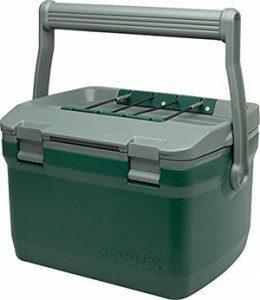 Stanley Adventure Small Ice Chest is equipped with double walls and special construction of locks and handle that makes it one of the best variants to choose from. 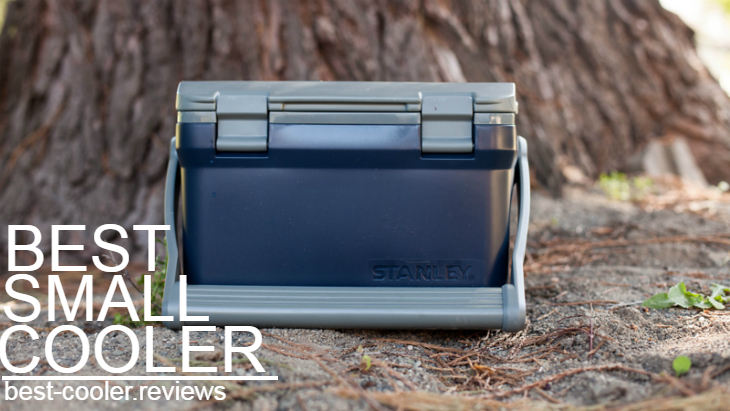 According to manufactures’ promises Stanley Adventure is able to keep your food and drinks cold during day or even day and a half. These terms coincide with users’ reviews who say that an average duration of holding cold inside cooler is one day. 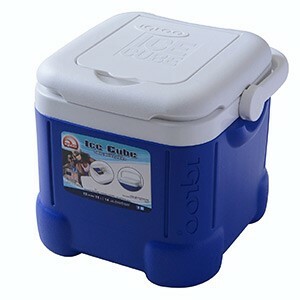 Many users write that the construction of this cooler give an ability to take it to a boat, car or wherever you want. Thanks to small size and compact form this cooler will easily fit any space you want. This variant will be great for those who don’t know whether they need to cold their food or to warm it in most cases. Wagan’s Cooler & Warmer will cope with both these tasks and moreover it doesn’t need ice! The capacity of this cooler/warmer is 24 liters and it means that you will have more than enough place to put all food and drinks that you need warm or cold during some period. Wagan’s Cooler & Warmer allow you to warm your food or beverages up to 140 degrees Fahrenheit or to chill them from 32 to 36 degrees Fahrenheit. This cooler is equipped with AC adapter which will help you to plug cooler wherever you are. With such opportunity to plug cooler you will not worry about your products because they will stay fresh. Beside its dual functions Wagan’s Cooler & Warmer has got its popularity because of its form and size. Special construction will save you from problem where to put it because this cooler can be easily placed in almost every free space inside your car. And finally our last candidate to be the best small cooler – Coleman Soft 10 Can Cooler. This cooler has got a status of universal cooler in the world market. This cooler has different pockets where you can put other things that you don’t want to be cold as for example beverages. Being equipped with lasting rubberized handles and durable material of the body this cooler has a great demand among users worldwide. In some reviews we have read that in the process of time the Velcro that is situated on the front pocket of Coleman Soft 10 Can Cooler wear down a little bit but in comparison with significant proc of these cooler such disadvantage is really minor. This cooler is really worth title of the best small cooler on the soft side and we definitely recommend it to purchsing. Firstly you should understand that such coolers as small ace chest coolers fit only for short trips or parties outdoors. If you are going to use cooler during long period of time it will be better to choose from larger variants. But for those who need a small portable cooler for several day trips or parties with friends we have prepared some tips that will help you to make the right choice. You should pay attention on such coolers’ characteristic as their cleaning in the case when you often spill beverages or transport products that have a strong long lasting smell. Many coolers have a special body material that allows you to clean your cooler easily and quickly. Good variant for you will be Rubbermaid Small ice Chest. Second important thing while choosing a cooler is purpose of its use. If you need small cooler to use it as a lunch box and take it to work every day, you don’t need models that are created for taking to fishing or hunting. 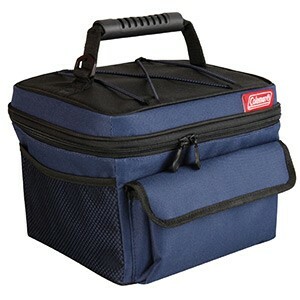 An excellent substitute of your habitual lunch box will become Stanley Adventure Small Ice Chest. In the case when you need your cooler to take some beverages and sandwiches for outdoor recreation the Coleman Soft 10 can cooler will fit ideally. 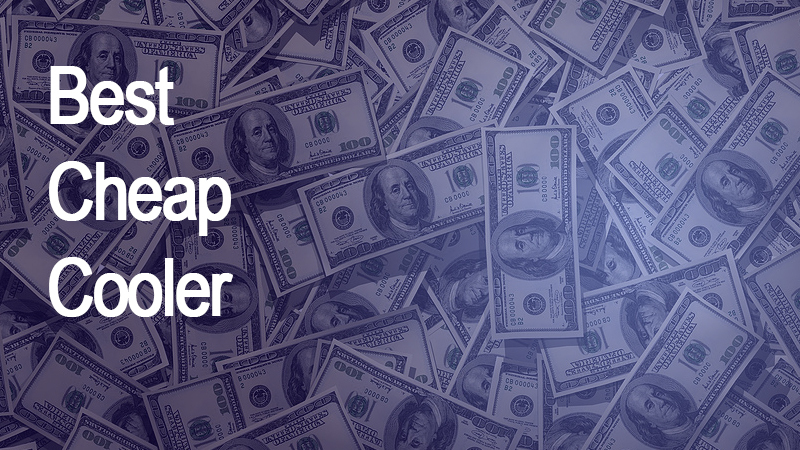 Price of the cooler is one of the main things to which almost everybody pays attention. If you can’t afford expensive cooler for you, than it will be better to consider soft-sided variants of coolers. In the case when you are ready to spend a little bit more money on the new cooler and purchase variant that will hold an ice longer we recommend you to consider one from the above listed coolers. Nevertheless you should consider all available small coolers for sale on Amazon and pick up cooler that will suit you by its price and features. For additional information we recommend you to read our article about Best Camping Coolers. When you will finally decide that you should change your cooler for the small one, and determine what characteristics of this new cooler will be the best for you, then our article will help you to choose the best one. We sure that our article will bring you a lot of useful information and help you to make your final choice. Also our team recommends you to pay your attention on Cooler Reviews & Guide post and read more important information there. It is not so hard to choose the best soft cooler as it may seems from the first view. The most important thing which will help you to create a “sketch” of your best cooler is clear understanding of cooler’s features that you need. When you will have a list of characteristic that are necessary for your needs, then the final choice will be much easier to you. So, we recommend you to think over all features that you want from your new small cooler and compare it with coolers’ characteristics that are listed in our article. We wish you a good luck and successful purchases!